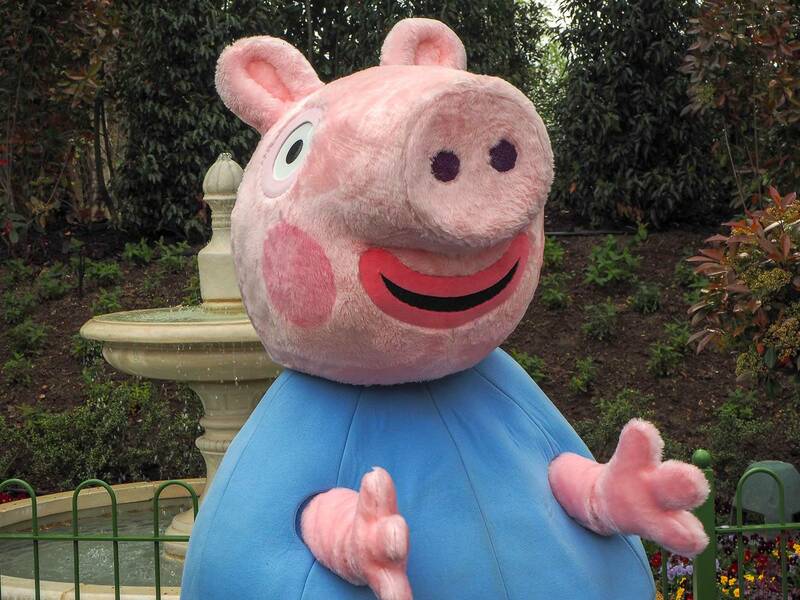 Last summer we visited Peppa Pig World and we could see that they were in the middle of building some new rides. We could tell there was a castle, but we couldn’t work out exactly what the new rides were going to be. 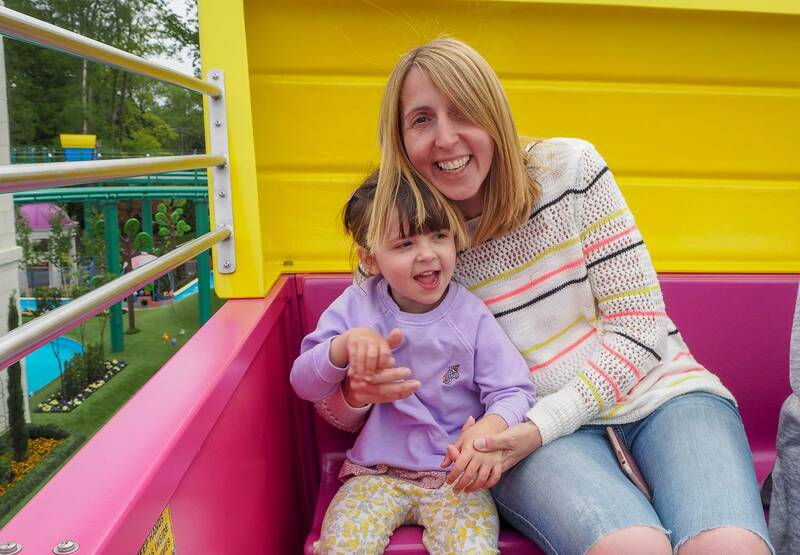 Holly and I were invited to the press launch of the new two rides at Peppa Pig World and to say that we were excited is an understatement. My little Peppa Pig fan was jumping up and down with excitement when I told her where we were going. 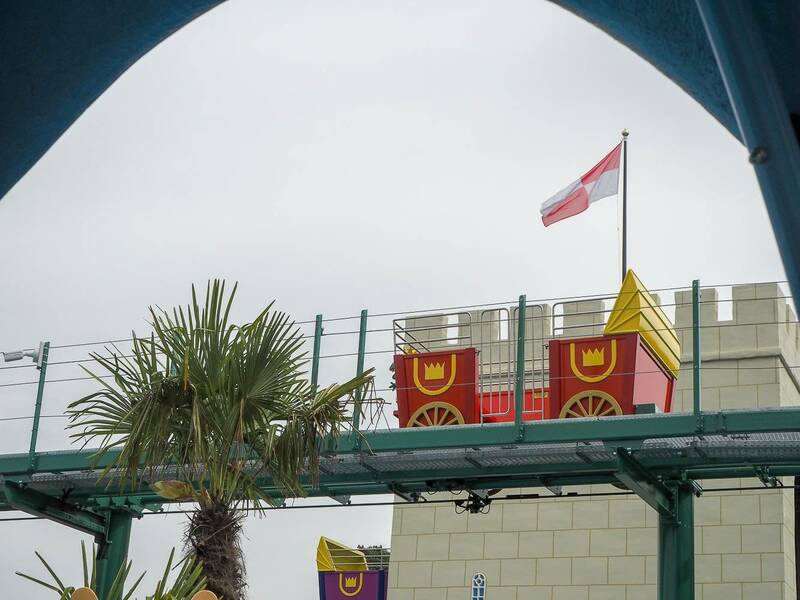 The two new rides are The Queen’s Flying Coach Ride and Grampy Rabbit’s Sailing Club and we couldn’t wait to see what they would be like. As we arrived in the new area, you can see both the new rides and they’ve very cleverly made use of the space. They’ve built a castle and both rides take you around the castle grounds. With Grampy Rabbit’s Sailing Club boat ride down below and The Queen’s Flying Coach Ride up high above the boat ride. We spotted the entrance to Grampy Rabbit’s Sailing Club ride and headed over to it. The best way to describe it is imagine the river rapids, without the rapids part. 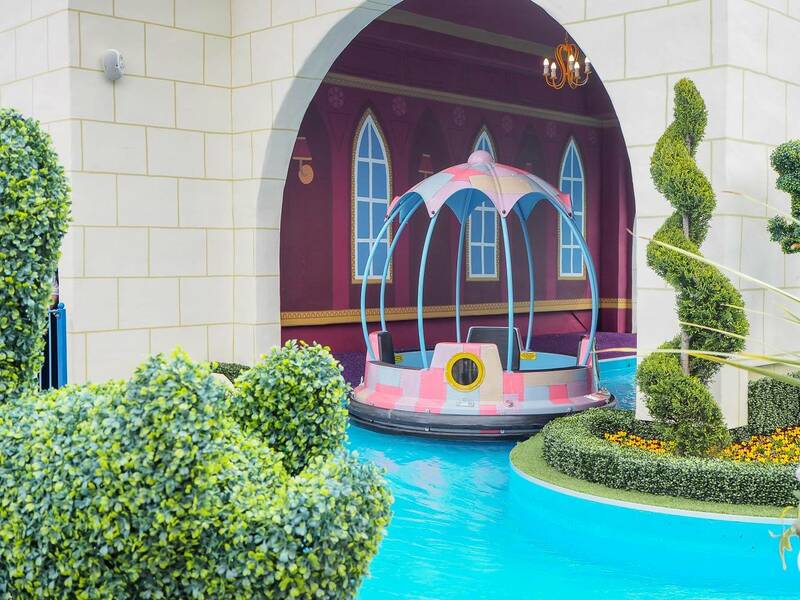 It’s a lovely nice gentle boat ride that children of all ages will love. Each boat fits up to 4 people and it gently spins around as you make your way down the river. As it takes you around the grounds of the castle, you will see Peppa and George having a picnic. With George dressed as a knight and Daddy Pig dressed as a king. All familiar from the TV series. The ride was a lot longer than I was expecting and if you had waited a long time in a queue, it’s not over in 2 minutes. 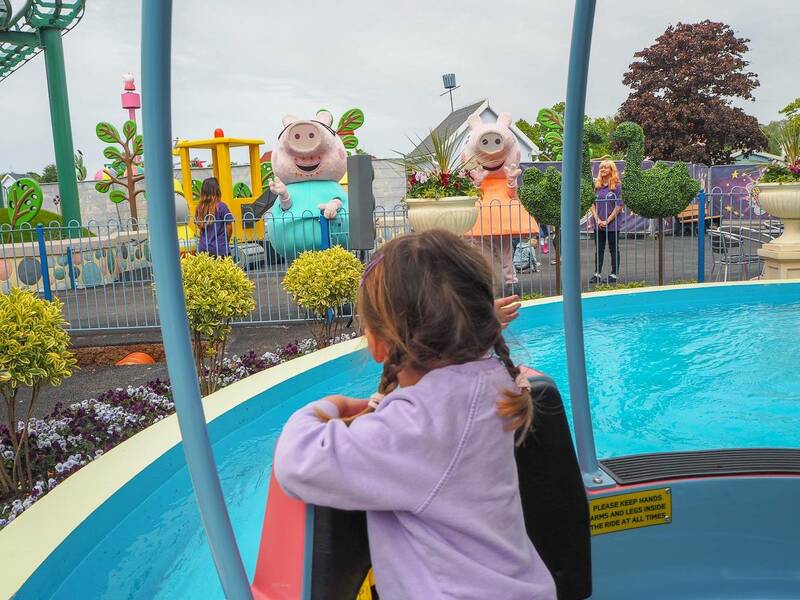 There are tunnels to go through and you get to see Peppa Pig and the Queen jumping in muddy puddles. 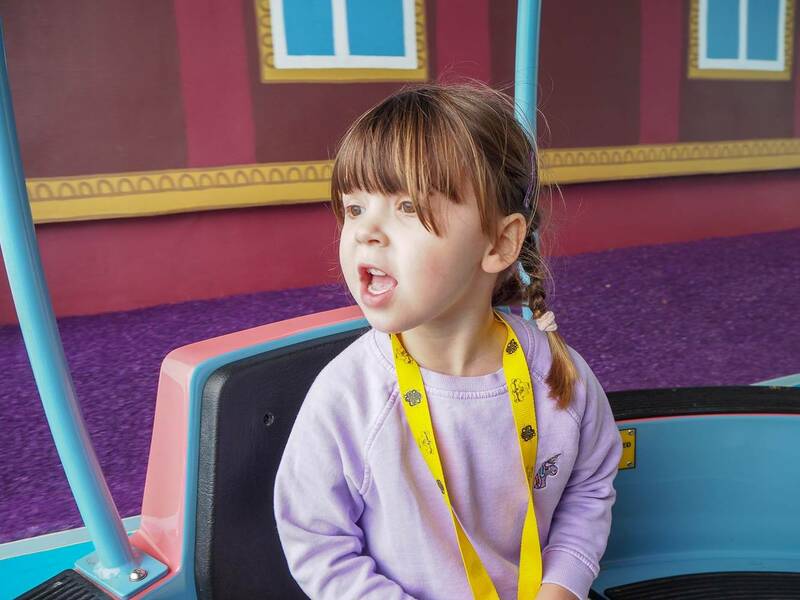 Holly was very excited all the way around, there was so much to see and lots of new characters that are not in the original part of Peppa Pig World. 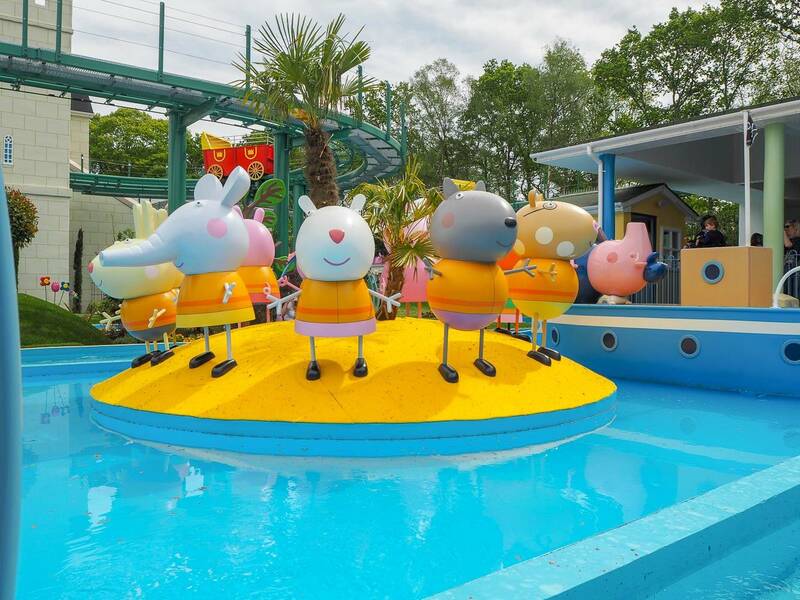 At the end you get to see all of Peppa’s friends on an island wearing their life jackets. Next to them is Grandpa Pig’s boat, with Grandpa pig having a snooze. Holly thought this was hilarious! The detail on the ride was brilliant, you can see references to the TV programme all around. We then headed over to try out The Queen’s Flying Coach ride. Having seen it from the boat ride, we couldn’t wait to have a go. You climb, or in Holly’s case run up the stairs of the castle and you climb into your Flying Coach. Each coach can seat up to 6 people. 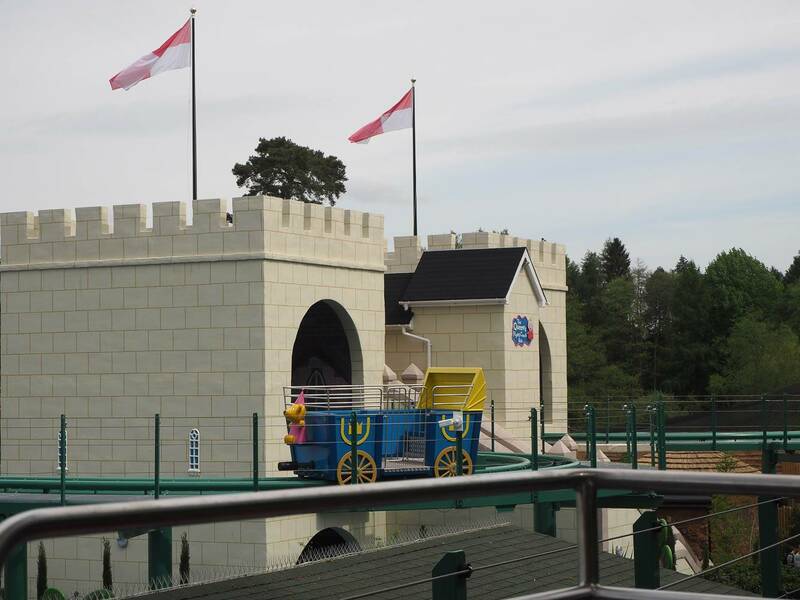 As you can see from the photos, the ride is up high and takes you through the castle and around the grounds. 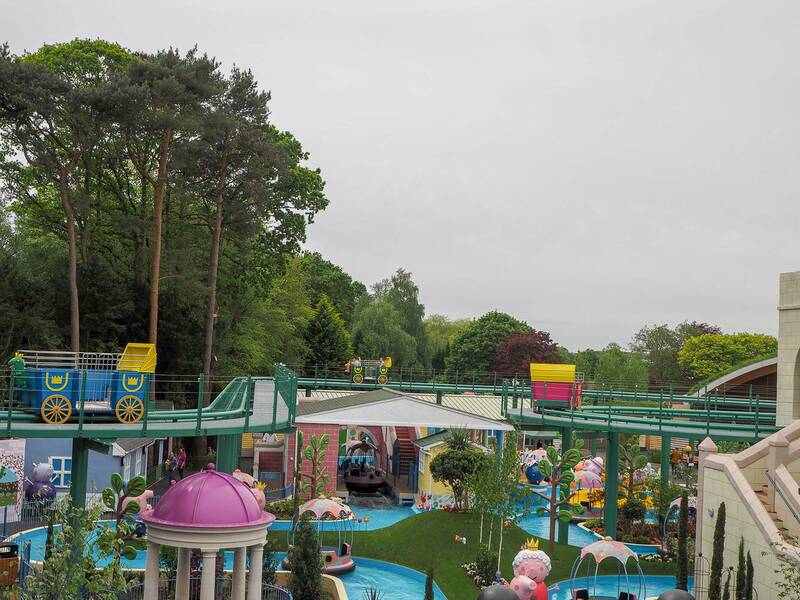 You get a really good view of the whole of Peppa Pig World. A great way to have a little sneak at what the queues are like on the other rides! 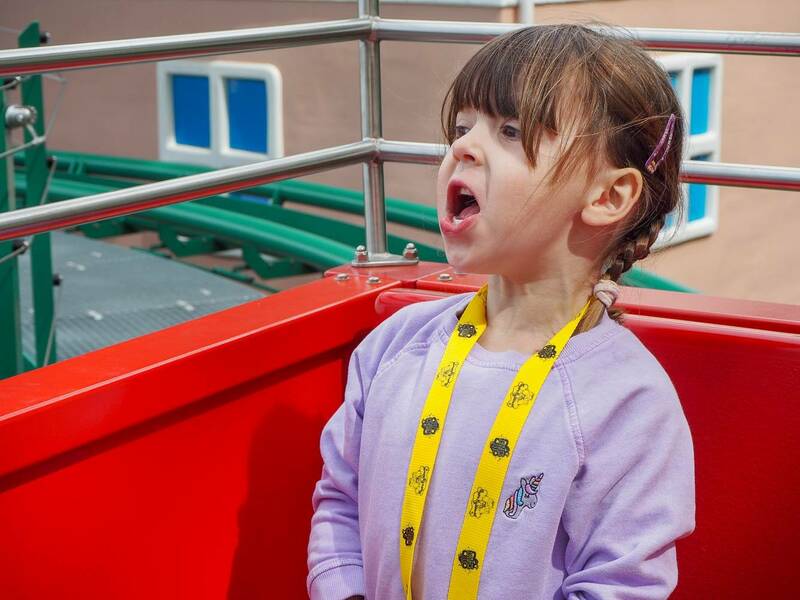 In case you are wondering what Holly is screaming in this photo…”This is AMAZING!’. Which I think sums up what she thinks of these new rides. As we made our way around the new area, we were greeted by George who was saying hello to everyone. Holly also spotted mummy and daddy pig when we were on the boat ride and waved to them both. Dotted around the new space are new characters to see. 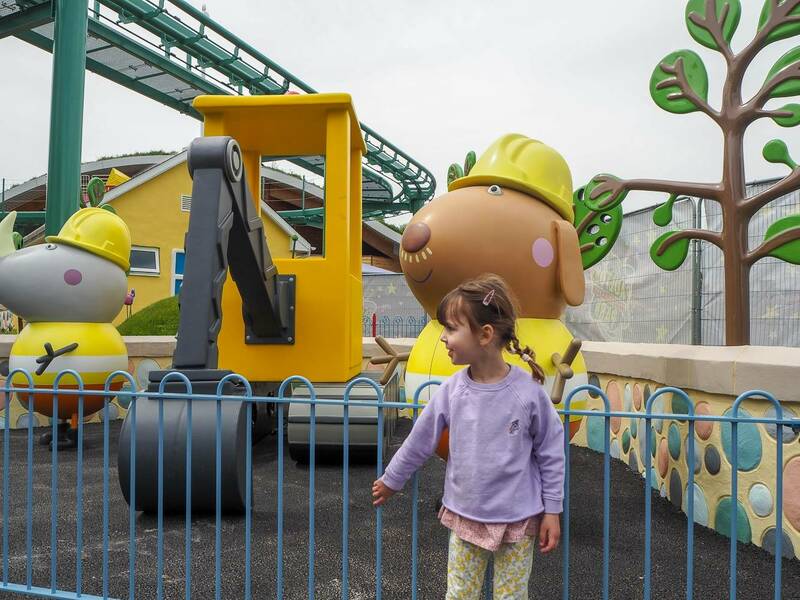 Holly loved seeing Mr Bull, his workman and his digger. There was also a water piper that had burst, with real water bursting out of it. 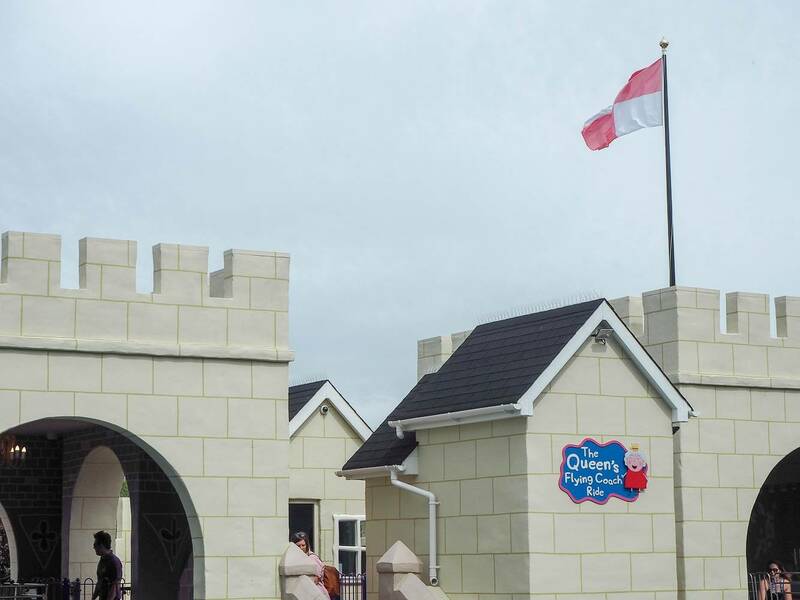 They’ve also added a new cafe, called The Queen’s Kitchen which served light snacks and drinks. 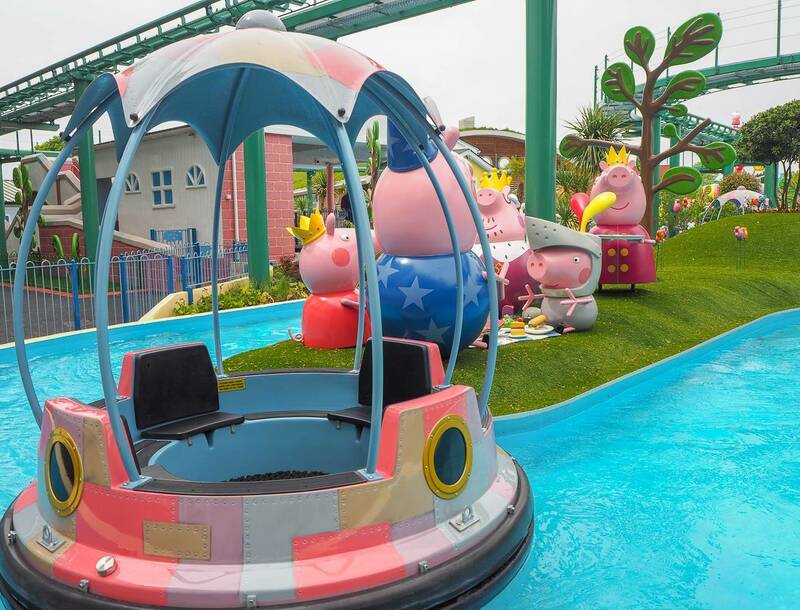 I think that both these rides really compliment the rest of Peppa Pig World. It’s nice to add some new rides, for children (and parents) that have been a few times. As I mentioned before they’ve made a great use of the space and these rides are nothing like they already have in Peppa Pig World. I can see they are going to be a big hit! 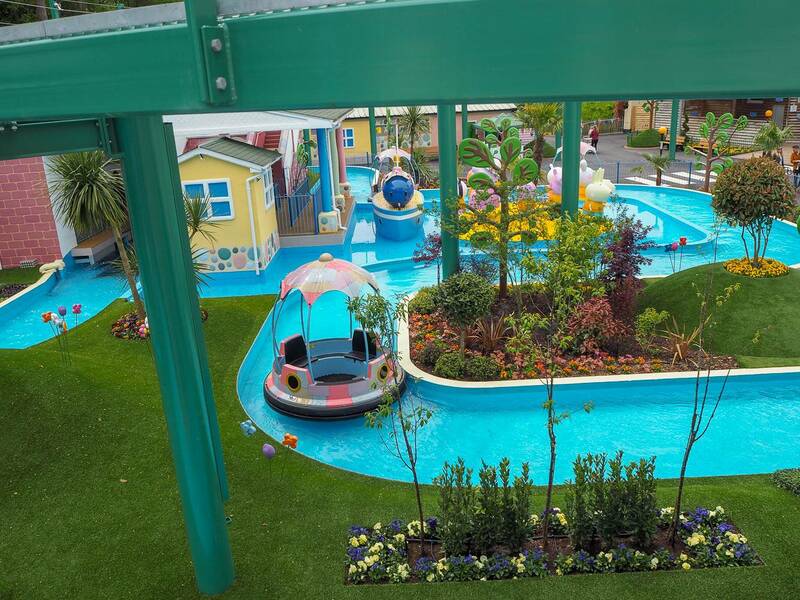 If you’re planning a trip to Paultons Park soon, then you’ll be pleased to hear that the new rides open on Wednesday 16th May 2018, yes in two days time! 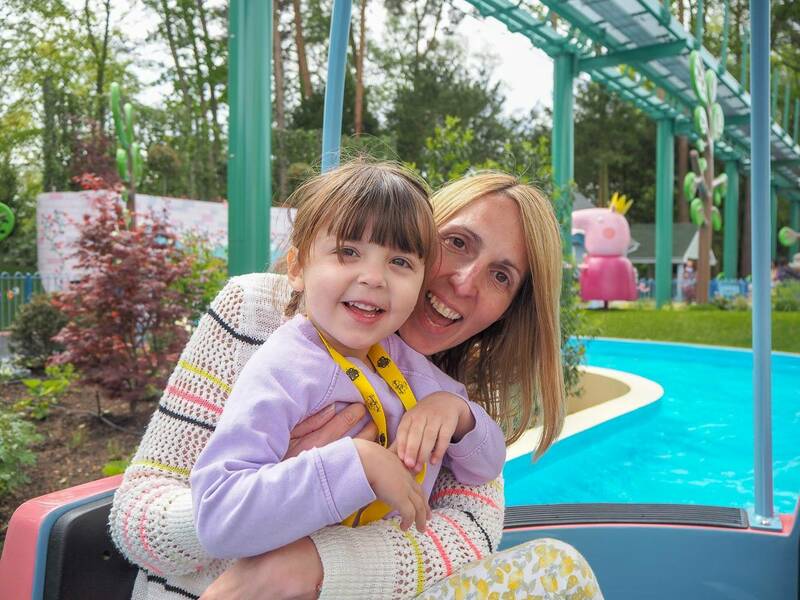 Disclosure: We were kindly invited to the press day at Peppa Pig World. All views, opinions are my own. Fantastic photos! It was such a great day wasn’t it? The new rides are fab! The Queen’s coach ride looks really good, we could see it when we went last month. 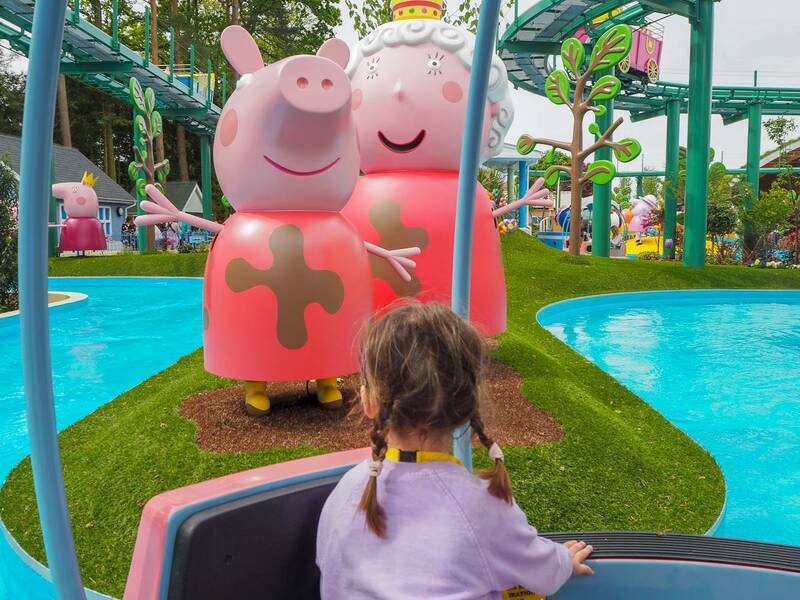 Although the queues are quite long at Peppa Pig World, the rides all last a little while. Looks like you had a fab day and you were lucky with the weather too! I’m so excited for these – we saw them building them last year and they look like great additions to the park! Looks like you had an amazing day! We can’t wait to get down there and give the new rides a go. Ahh fab photos and it sounds like you had so much fun! I’m gutted we didn’t make it, the kids would have had a blast by the sounds of it! Oh my goodness this look absolutely incredible. My daughter would love this!! We were there too! It was a great day wasn’t it?! We’d never been before and thought it was fab!